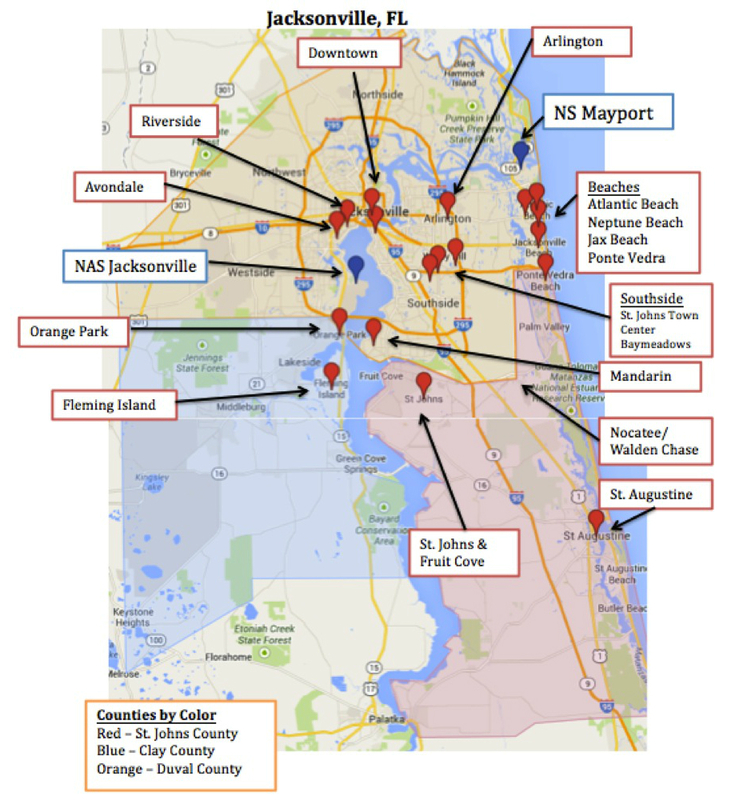 If you are PCSing to NAS Jacksonville or NS Mayport, this PCS Guide will help you get a better feel for the areas that surround Jacksonville. Jacksonville is very spread out and it's hard to know where to live. This guide will help you narrow down your search and hopefully reduce your level of anxiety. If you have additional questions about this PCS Guide to Jacksonville and Mayport, feel free to contact us or join our Facebook Group. Download the complete PCS Guide with maps and get started with your research! Located just north of downtown, the Springfield area consists of beautiful older historic homes. This area is being revitalized and is in transition. This is an area to watch over the next couple of years. One military spouse who has lived in the area for 3 years says she loves the area, knows her neighbors and her neighbors look out for her when she’s home alone. It may not be an area for everyone, however it is up and coming and might appeal to some military families. Southern Living named it the best of ‘The South’s Comeback Neighborhoods.' If you are looking for areas with old historic homes, you may also like the Avondale/Riverside and San Marco areas. Commute to NS Mayport: 20 minutes to Mayport Gate. During morning commute, gate wait time can range from 10-25 minutes. The Riverside/Avondale is one of America’s great historic neighborhoods. This residential area is located southwest of Downtown Jacksonville along the St. Johns River. The Riverside/Avondale area is known for its architecture, emphasis on historic preservation, and beautiful streets adorned with tall moss draped oak trees. There are very few areas in Jacksonville where you can walk to restaurants and shops, but this area is one of the best. The Riverside/Avondale area has three commercial districts with excellent restaurants and boutiques; Five Points, Kings Street District and Shoppes of Avondale. This area is also home to the Cummer Museum & Gardens and the Riverside Arts Market. The area is great if you like to walk to shops and restaurants nearby. Homes range in all different sizes and prices. The Riverside/Avondale area is perfect for those looking for a quick commute to NAS JAX. This area is popular for families with kids, families without kids, and singles. Riverside/Avondale area is a part of the Duval County Schools so it is very important to check the schools your children will be attending. There is one highly rated elementary school in the Riverside/Avondale area. Just south of Avondale is the beautiful Ortega neighborhood, which also has a highly rated elementary school. Riverside and Avondale are actually two neighborhoods, located next to each other, and are both listed on the National Register of Historic Districts. Commute: Easy access Interstates 95 and 10. Schools: Middle and High Schools are not highly rated. Ortega Forest and/or Ortega Farms is a 15 minute drive to Downtown. Stockton Elementary, located in Ortega, is a fantastic elementary school. This area is popular for the families with kids, families without kids, and singles. Commute to NS Mayport: 24 miles, approximately 40 minutes to Mayport Gate. During morning commute, gate wait time can range from 10-25 minutes. The San Marco area is located just south of downtown Jacksonville and sits on the eastside of the St. Johns River. San Marco is one of the oldest sections of North Florida, but it’s very unique in that it has a mix of both old and new. The commercial district of “San Marco Square” was modeled after Venice’s Piazza San Marco and features several Mediterranean buildings and a fountain. The square features the San Marco Theatre, an art-deco single screen theatre, still in operation, along with shops and restaurants. Commute to NS Mayport: 19 miles, approximately 35 minutes to Mayport Gate. During morning commute, gate wait time can range from 10-25 minutes. Orange Park has older, more established neighborhoods. Some areas of Orange Park may be safer than others. Big box chain stores, such as Publix and Target, and strip malls are nearby. There is a new children’s emergency room in Orange Park. The traffic in Orange Park is really bad, especially along US 17 from I-10 to 295 to Green Cove Springs. Even with three-lanes each way, it sometimes becomes stop and go. Also, Blanding Blvd has really bad traffic. Schools are ok in this area, but it might be more specific to certain areas. Areas on the Westside of Blanding Blvd outside Orange Park may be areas to avoid. Commute to NS Mayport: 36 miles, approximately 45 minutes to Mayport Gate. During morning commute, gate wait time can range from 10-25 minutes. Fleming Island has a suburbia feel with newer construction homes with lots of amenities. There is a mixture of chain and local stores and restaurants. Fleming Island has 2 main planned developments, Eagle Harbor and Fleming Island Plantation. Both have multiple neighborhoods, pools and golf courses. This area is known for good schools and is very popular among military families. Fleming Island is a neighborhood itself. Eagle Harbor – zoned for Fleming Island Elementary, which is a great schools. Both are a wonderful planned community with schools, pools, tennis and golf within walking distance. Commute to NS Mayport: 41.6 miles, approximately 55 minutes to Mayport gate. During morning commute, gate wait time can range from 10-25 minutes. Neighborhoods within 5 miles of Downtown Area. Ft. Caroline located on the banks of the St. John river. It is actually the first European settlement in North America. The neighborhoods surrounding Ft. Caroline are safe and great for an easy commute to Mayport. You want to stay EAST of 295 in the 32225 zip code. Ft. Caroline Neighborhoods: Hidden Hills Country Club, Harbour Island, Fort Caroline Cove, Fort Carline Lakes, Harbor North, Colony Cove. Commute to NS Mayport: 8-12 miles; 16-18 minutes to Mayport gate. During morning commute, gate wait time can range from 10-25 minutes. The Intracoastal West area extends East from Southside Blvd to the Intracoastal Waterway, North of J. Turner Butler Blvd. and South of Atlantic Blvd. (map of the area) This is a great, convenient area for a Mayport commute, a quick drive to the beach, and a short distance from the St. John’s Town Center restaurants and shopping area. Many of the neighborhoods in this area are planned communities with gated access, clubhouse and pool. The main roads that encompass this area are Kernan, Hodges, San Pablo and Beach Blvd. Tamaya, is the newest master planned community being built off Beach Blvd. Nearby Neighborhoods: Map of the neighborhoods with a quick descriptions. Queen’s Harbor Yacht Club, Ibis Point, Osprey Point, Holiday Harbor, San Pablo Creek, The Woods, Kensington, Jacksonville Golf and Country Club, Waterleaf, Marsh Sound, Covington, Tamaya, The Villages of San Pablo and Glen Kernan. Commute to NS Mayport; 8-11 miles, 19-24 minutes. During morning commute, gate wait time can range from 10-25 minutes. Neighborhoods within a 5 miles of NS Mayport. Atlantic Beach is the seaside community located just south of NS Mayport. Home to miles of beaches and Hannah Park, Atlantic Beach is a dream for surfers, campers, bicyclists and beach-goers. The downtown area of Atlantic Beach meets the downtown area for Neptune Beach with excellent restaurants and nightlife. Atlantic Beach is also home to the beautiful One Ocean Resort and Spa. Nearby Neighborhoods: Ocean Village, Oceanwalk, Sea Gardens, and Atlantic Beach Country Club. Atlantic Beach Country Club is a brand new community currently being built over the old Selva Marina Country Club. They are planning to build 174 single-family homes. This is by far the quickest commute to Mayport without actually living on base. Commute to NS Mayport: 6 miles; 15 minutes to Mayport gate. During morning commute, gate wait time can range from 10-25 minutes. Neptune Beach sits just south of Atlantic Beach and just north of Jacksonville Beach with a population of 7,000. It is the smallest of the beach cities and has defined itself as a small community-oriented suburban area. There are mostly single-family homes in this area. Close to great restaurants, cute coffee shops and beachside boutiques. Commute to NS Mayport: 8 miles, 19 minutes to Mayport gate. During morning commute, gate wait time can range from 10-25 minutes. Jacksonville Beach offers beach style living combined with a great neighborhood feel. In the heart of Jacksonville Beach you will find resorts, shopping, restaurants, beach boutiques, and nightlife. Nestled in the south area of Jacksonville Beach are great family oriented neighborhoods. The South Jax Beach area is home to South Beach Park with Sunshine Playground, a splash park, tennis courts, basketball courts and the local fire station. This area is walkable to great restaurants and coffee shops too. Nearby Neighborhoods: Ocean Cay, Rip Tide, and the neighborhoods bordering the park off Osceola Blvd and South Beach Parkway. Commute to NS Mayport; 10 miles, 22 minutes to Mayport gate. During morning commute, gate wait time can range from 10-25 minutes. 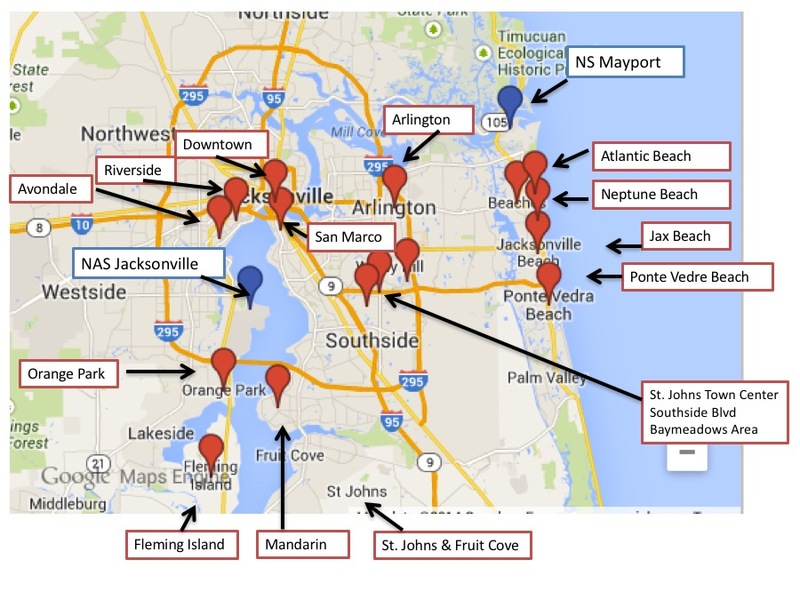 Neighborhoods within 5 miles from Jacksonville Beaches Area. The Southside area of Jacksonville is the most up and coming area in Jacksonville. The Southside area is booming with young professionals and host’s corporate headquarters to many businesses. The St. Johns Town Center is the largest shopping area in the city. Every restaurant and store you can imagine is located here. The Tinsletown area of Southside is bustling with a movie theater, shops, and restaurants. The recommended neighborhoods in this area are around the St. Johns Town Center and Baymeadows. This area is the PERFECT spot for those that may need to commute to BOTH NS Mayport and NAS JAX. The St. Johns Town Center is a 150 shop open air mall. It is not only home to the heart of shopping and dining in Jacksonville, but also many condos, apartments and townhomes. This area of Southside is booming with brand new apartment complexes and options for living. Many of the new complexes are within walking distance to the mall. Right down the road is the new Tapestry Park, a mixed use development of retail, office space and apartments. Commute to NS Mayport; 16 miles, 25 minutes to Mayport gate. During morning commute, gate wait time can range from 10-25 minutes. Baymeadows is right around the corner from the St. Johns Town Center but this area has a more suburban feel with many more single family homes and a brand new high school. Atlantic Coast High School is Duval County’s newest public high school. Baymeadows area is defined as Baymeadows Road EAST of Southside Blvd, Gate Parkway, extending north towards the Town Center. Duval County Charter School is located in Baymeadows. Nearby Neighborhoods: Reedy Branch Plantation, Hampton Glen, Hampton Park, James Island, Deercreek Country Club, Timberlin Parc, East Hampton, Summerfied. Commute to NS Mayport: 20 miles, 27 minutes to Mayport gate. During morning commute, gate wait time can range from 10-25 minutes. The area located between San Marco and Mandarin along State Road 13 (known as San Jose Blvd) you will find some lovely homes and communities running parallel with the St. Johns River. You will find a mix of older and newer homes in well-established neighborhoods. San Jose is a convenient place to live and shop, with some of the city’s finer private schools. Also offers easy access to Baymeandows area as well as easy access to the Interstate to NAS Jax. Named for the Mandarin orange in 1930, this neighborhood sits on the St. Johns River south of San Marco. Mandarin is known for its great oak trees draped in Spanish moss. Mandarin is known for good schools. Commute to NS Mayport: 37.2 miles, approximately 45 minutes to Mayport gate. During morning commute, gate wait time can range from 10-25 minutes. Ponte Vedra located Southeast of Jacksonville and north of St. Augustine. Ponte Vedra Beach is a highly sought after tourist area and home of the ATP Tour, PGA tour and The Players Championship played at TPC Sawgrass. Ponte Vedra is located in St. Johns county which is known for its’ excellent schools. Many new neighborhoods and planned communities have developed over the last few years. Ponte Vedra is home to Nocatee, a huge master planned community recently ranked as the 3rd Best Selling Community in America. Commute to NS Mayport: 33 miles; 45 minutes to Mayport gate. During morning commute, Gate wait time can range from 10-25 minutes. Nocatee is family friendly and very military friendly. The neighborhood has great amenities and "gatherings" like Food Truck Nights, adult social, teen socials, etc. etc. It's a very active community and there are always people out biking, running, etc. Lots of military and people are very friendly. It's a little bit of a drive to big box retail like Home Depot, Target, Walmart, etc. (15-20 minutes) and there is a big frustration from residents with the CDD's lack of ability to draw in any retail, restaurants, etc. in the town center. Great proximity to St. Augustine for weekend and day trips. It's less than a 30 minute drive and there is always lots to do there. Schools are great. The only downside is that you're far from shopping areas and it's not quite built up completely yet. Walden Chase- The homes in this zip code hold up value, and the area is really nice and safe. Commute to NS Mayport: About 45 minutes, but you can shave off about 10 minutes of that now with 9B connector opened up. During morning commute, gate wait time can range from 10-25 minutes. Schools: St. Johns County Schools – Schools are one of the best in Florida, however they are having over crowding, but they are in the works of building new schools. 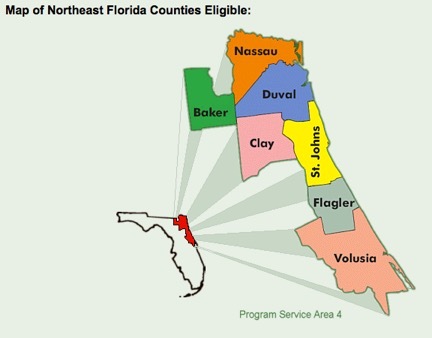 Nease High School is close to Nocatee. It is a wonderful school. The IB program is very challenging and rewarding. This area is very family-friendly with a suburbia feel. There are several big planned communities including Durbin Crossing, Aberdeen, and Julington Creek Plantation. This area is known for having top notch schools, which is a big draw. Shopping is primarily big-box, with a couple higher-end places like Fresh Market. Two large malls (The Avenues & St Johns Town Center) are 20-30 min away in Duval county. Restaurants are a mix of chain and local (some good ones are The Saucy Taco, Blackstone Grille, Julington Creek Fish Camp). This is a great area for families with kids. Lots of military families have moved to this area. Durbin Crossing- A newly built neighborhood with active community activities. Nice parks with several soccer fields. Commute to NS Mayport: 36 miles; 45 minutes to Mayport gate. During morning commute, gate wait time can range from 10-25 minutes. Neighborhoods near the Southside of Jacksonville. NAS Jacksonville MIlitary Housing is Patriots Point and River Oaks. St Johns is known for their great schools. Schools are better down by Fleming Island area. Other areas it depends on the school. Check into military preference into magnet schools, which provides the opportunity to enroll in some of the better schools around town without being zoned for those schools. Click to read neighborhoods reviews, military housing reviews, recommended REALTORs, recommended local businesses, and a list of fun things to do near NAS Jacksonville. Wolfsons Children's hospital and Nemours Specialty clinics are located in Jacksonville. Nemours is one of the top pediatric multi specialists in the country. 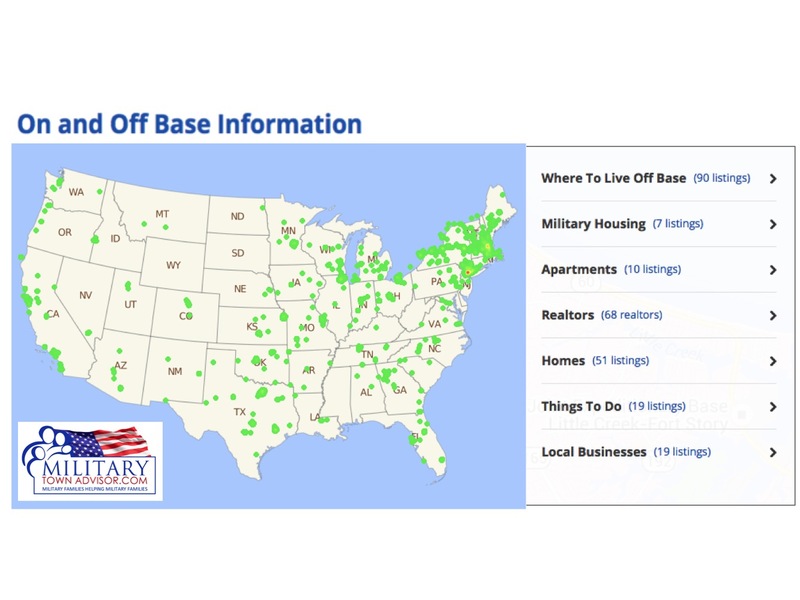 Whether you are looking to buy or rent a home near Eglin AFB, search our large database of Military Friendly Realtors near NAS Jacksonville. Real estate agents can help you narrow down your search and keep you in the loop when houses come on and off the market. Search MilitaryByOwner's military homes for sale or rent near NAS Jacksonville. Read our Jacksonville blog stay up to day on upcoming events, lists of fun things to do, local restaurants, shops and more.